This years Masters began similar to previous years except, although there, Arnold Palmer did not hit a ceremonial drive. Jack Nicklaus did not out drive Gary Player and I read he got some good natured ribbing from Rickie Fowler. 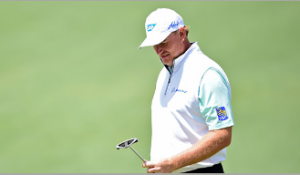 On the Day 1, Ernie Els was snake bit on the first hole and 7 putted from 3 feet for a 10. I feel bad for Ernie but it sure should make us amateurs feel better, for we have done similar things. The weather did not cooperate this year and Augusta National showed it’s teeth. Wind and especially gusting wind can wreak havoc on ball flight and also on putts. I forget who it was, but 1 golfer had his ball on the green at the edge of a downslope to the water. You may have guessed it, a gust of wind started the ball moving just enough. It took the slope and went into the water. By the rules, it was as if his ball had not stopped on the green and rolled into the water. He had to take a drop and play up. That’s golf by the rules! The wind made driving and approach shots difficult and the scoring average showed it. Rising each of the first 3 days. The cut came at +6. Phil Mickelson missed the cut as did a number of other major champions. Then there is Jordan Spieth. This amazing youngster (he’s just 22), with the composure of a seasoned veteran, shot a 5 under par round on the first day to lead the tournament. He led wire to wire in last years Masters and here he is again. He’s led in all 3 rounds leading up to todays final round. No one has ever won 2 majors in a row leading wire to wire in both. Go Jordan!! He comes across as such a likeable kid, you can’t help but root for him. He has made it more interesting by finishing his 2nd round bogeying 17 and 18, finishing with a 74. In round 3 he was under par until he bogeyed 17 and double bogeyed 18 to shoot a 73 and only take a 1 stroke lead into Sunday. play well and fell behind so the matchup did not continue on Sunday. Smylie Kaufman, another youngster, winds up in 2nd place and in the final group on Sunday. Perhaps a wonderful side story is Hideki Matsuyama, who they claim is the most talented golfer to come out of Japan, working his way into the second group after 3 rounds.. Perhaps you prefer Bernhard Langer, the 2 times Masters champion being only 2 shots back after 3 rounds at the ripe age of 58. He actually won his last Masters before Jordan Spieth was born. Amazing golf! It’s one of the reasons I love golf so much. It’s ageless, timeless, just great. What other sport do you see competitors with a 36 year age difference. 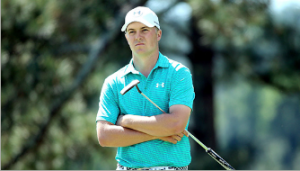 Jordan Spieth is leading by 5 going into the back 9. Sorry, I need to stop writing and just watch.